One of the things I love most about being a Product Manager is the opportunity and responsibility to keep tabs on industry news and developments. Having a good grasp of the digital publishing landscape – from emerging trends to competitive research – is critical to our ability to serve users well. When you’re in the sharing game, there are few better places to get a pulse on the industry than at Facebook’s annual developer’s conference, f8. And so, to f8 AddThis went. If you keep up with tech news, you may have heard that this year’s f8 was the largest to date, with roughly 5,000 people from around the globe descending on San Jose, California to hear Mark Zuckerberg’s keynote address, see what new stuff Facebook is working on, play around with new technologies, and network with others in the industry. So, what were the highlights this year? Messenger. WhatsApp. Instagram. Why pick only one? A major theme of this year’s f8 was Facebook’s continued investment in their messaging services, particularly Messenger. 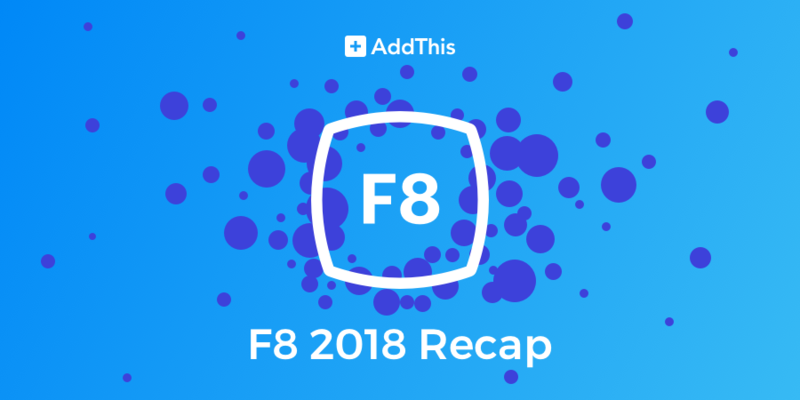 The f8 schedule had an impossible-to-miss 14 different sessions devoted to Messenger, ranging from how businesses can better their customer experience through Messenger to how natural language processing can enhance Messenger conversations. If you’re an AddThis publisher, you’re in luck: Messenger is included out of the box in our sharing services (WhatsApp, too!). Get the Messenger share button now. Get the WhatsApp share button now. How can companies better conduct user research? How can products more prominently communicate and showcase how user data is being used to fuel the user experience? A number of conference sessions catered to developers, marketers, and product managers aiming to build better products that users truly understand and are comfortable spending time with. The “Mythbusting Usability Research” talk was particularly interesting, and offered fun ideas like user group debates (e.g. one group of advocates of your product debates another group of recently churned users) to help teams get at the heart of what matters most to their users. Speaking of which, what matters to you? Let us know. The augmented reality and virtual reality demos Facebook had set up throughout the conference are pretty darn cool; Facebook is positioning the Oculus Go as the “easiest way to get into VR.” The Go is very neat, but at the end of the day, it’s still the discovery and sharing of information – no matter the evolving medium – that continues to make the digital world tick. With over 200 global sharing services available off the shelf, AddThis is proud to help publishers grow their audiences and communities online. Is AR and VR in AddThis’ future? Only time will tell.